The lovely bride and I had a great time roaming the artsy streets of Santa Fe, New Mexico last fall. The shopping, arts and food are fabulous. We stumbled into The French Pastry Shop & Creperie and couldn’t resist, having gone to Paris about a year ago. We ordered a cherry crepe and it was absolutely fantastic. 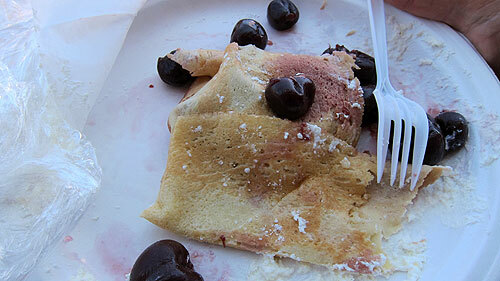 See the pic below of the crepe in mid chomp. My lovely bride had a smile as big as I’ve ever seen when she sunk her teeth in for her first bite of the crepe. Our coffees were excellent too. 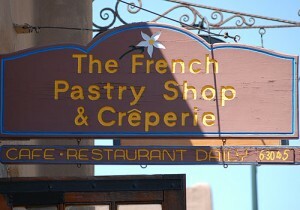 If you’re in Santa Fe, stop by the French Pastry Shop & Creperie.